Summary: For years, Valnora Edwin has advocated good governance, transparency, and rights for her fellow Sierra Leoneans. She has tackled issues such as gender rights, children’s rights, HIV/AIDS, Ebola, mining, elections, and local government. Her life has been threatened numerous times by various interests that she has opposed, but she continues to represent citizens, most recently as a member of Sierra Leone’s Civil Registration Authority. Profile: Valnora Edwin is the director of the Campaign for Good Governance—CGG. CGG is a Sierra Leone NGO formed in 1996; it promotes the building of democratic institutions, transparency and accountability in government, active citizen participation in the political process, voter education, human rights, and the rule of law. CGG has been involved in projects in such diverse areas as gender rights, children’s rights, HIV/AIDS, Ebola, mining, elections, and local government. In 2012, Edwin expressed “grave concern over the continued challenges encountered by ordinary citizens to access basic social services.” By social services, she was referring to safe drinking water, electricity, fuel, and the ability to regulate abandoned vehicles and general lawlessness. And Edwin—who has experience in governance, public policy, and human rights—was not reluctant to call the government out on its responsibilities. She claimed that the sorry state of affairs was the result of “the high politicization of everything in the country”. Although the government has at times responded positively to her recommendations, other responses to Edwin’s speaking out have been, not surprisingly, negative: Edwin’s life has been threatened many times—in person, on radio, and through phone calls—from both sides of the political spectrum and from business interests whom she opposes. 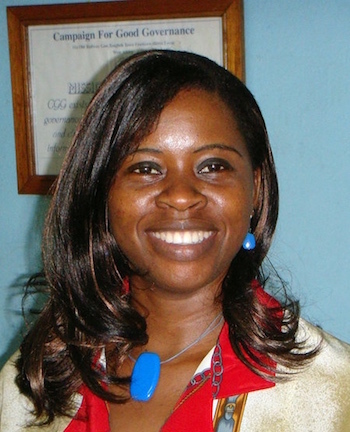 Edwin consistently tries to be impartial in her calling out of politicians: “As a preacher and advocate for good governance and democracy, I am also highly engaged in calling on opposition parties as well to maintain and promote peace in Sierra Leone.” In addition, she has encouraged leaders not to wage arguments in the media. Edwin’s advocacies have brought about some victories. She strongly and successfully opposed a third-term bid by a Sierra Leone president because such a bid ran counter to the Constitution. She helped pass the Child Rights Act of 2013. And she managed to get passed into law a correctional service bill; the law now states that the purpose of imprisonment is not only to punish inmates but also to help them become responsible citizens. Valnora Edwin remains a serious and effective advocate for her fellow citizens.